11th lunar month of 1747: he makes his first appearance on stage, at the Nakamuraza, playing a child role in the kaomise drama "Izu Gunzei Sumô no Nishiki". 11th lunar month of 1753: he becomes disciple of Ichimura Uzaemon VIII and takes the name of Bandô Matatarô IV at the Ichimuraza, playing the role of the yakko Kiyarasuke in the kaomise program "Kamuri Kurabe Yatsushi Kuronushi". 11th lunar month of 1759: Matatarô becomes katakiyaku during the Ichimuraza kaomise program "Okunizome Shusse Butai". 5th lunar month of 1762: his master Ichimura Uzaemon VIII dies. 11th lunar month of 1762: Matatarô plays the role of Koretaka Shinnô in the Ichimuraza kaomise drama "Kisoe Uta Sakae Komachi". 1st lunar month of 1763: Matatarô's rank in the Edo hyôbanki, katakiyaku section, is jô-jô (superior - superior). 11th lunar month of 1768: Matatarô becomes tachiyaku and achieves a great success by playing the role of Arakawa Tarô in the Ichimuraza kaomise drama "Otokoyama Yunzei Kurabe". 1st lunar month of 1770: Matatarô's rank in the Edo hyôbanki, tachiyaku section, is jô-jô-(shiro)kichi (superior - superior - (white) excellent). 11th lunar month of 1770: Matatarô moves to Ôsaka and plays the role of Eda Genzô in the kaomise program "Ma'ichimonjiya Sakigake Hyôban", which is produced by Ogawa Kichitarô I at the Naka no Shibai. 1st lunar month of 1771: Matatarô's rank in the Ôsaka hyôbanki, tachiyaku section, is jô-jô-(shiro)kichi (superior - superior - (white) excellent). 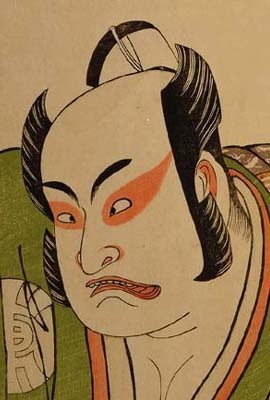 11th lunar month of 1771: Matatarô is back in Edo and plays the role of Harata Rokurô in the Ichimuraza kaomise "Kono Hana Yotsugi no Hachinoki". 1st lunar month of 1772: Matatarô plays at the Ichimuraza the role of Umeômaru in the drama "Sugawara Denju Tenarai Kagami"; the roles of Matsuômaru and Sakuramaru are played by Ôtani Hiroji III and Arashi Sangorô II. 11th lunar month of 1772: Matatarô moves to the Nakamuraza and takes part in the kaomise program "Ôyoroi Ebidô Shinozuka", which celebrates the great shûmei of the actors Ichikawa Ebizô III, Matsumoto Kôshirô IV and Ichikawa Komazô III. 11th lunar month of 1773: premiere at the Nakamuraza of the play "Gohiiki Kanjinchô", performed as a kaomise drama. Matatarô plays the roles of Bandô Tarô (!) and Ise no Saburô [casting]. This 46-days long performance, which is also the shûmei of Nakamura Rikô I, is a tremendous success. 9th lunar month of 1774: Matatarô plays in the same theater the role of Maboroshi no Takeemon in the drama "Futatsu Chôchô Kuruwa Nikki". 11th lunar month of 1774: Matatarô moves to the Moritaza and plays the roles of Kasuya Tôta and Kisanta in the kaomise drama "Ichi no Tomi Tsuki no Kaomise", which welcomes in Edo the Kamigata actor Nakamura Shingorô II. 1st lunar month of 1775: Matatarô plays in the same theater the role of Soga Gorô Tokimune in the new year program "Shida Yuzuriha Hôrai Soga". The roles of Kudô Saemon Suketsune and Soga Jûrô Sukenari are played by Ichikawa Danjûrô V and Bandô Mitsugorô I. 8th lunar month of 1775: Matatarô plays in the same theater the role Watanabe Minbu in the drama "Keisei Tsuki no Miyako". 11th lunar month of 1775: Matatarô moves to the Ichimuraza and achieves a great success by playing the role of Ômori Hikoshichi in the kaomise drama "Oyafune Taiheiki". His stage partners are Ichikawa Ebizô III, Iwai Hanshirô IV, Matsumoto Kôshirô IV, Ichikawa Yaozô II, Osagawa Tsuneyo II, Nakamura Noshio I and Sakata Hangorô II. 7th lunar month of 1776: Matatarô plays in the same theater the role of Sukune Tarô in the drama "Sugawara Denju Tenarai Kagami". 11th lunar month of 1776: Matatarô moves to the Nakamuraza and plays in the kaomise drama "Sakuya Kono Hana no Kaomise". 8th lunar month of 1777: Matatarô plays in the same theater the roles of Kajiwara Heizô Kagetoki and Yokawa no Zenji Kakuhan in the drama "Yoshitsune Senbon Zakura". 9th lunar month of 1777: Matatarô plays in the same theater the roles of Kajiwara Heizô Kagetoki and Yokawa no Zenji Kakuhan in the drama "Koi Nyôbô Somewake Tazuna". 11th lunar month of 1779: Matatarô becomes jitsuaku and plays in the kaomise drama "Uta Kurabe Tôsei Moyô", which celebrates the shûmei of Ichikawa Yaozô III. 3rd lunar month of 1780: Matatarô plays in the same theater the roles of Umeômaru and Shundô Genba in the drama "Sugawara Denju Tenarai Kagami"; the roles of Matsuômaru and Sakuramaru are played by Nakamura Nakazô I and Ichikawa Yaozô III. 4th lunar month of 1780: first Kabuki adaptation of Utei Emba, Kijô Tarô and Yô Yôdai puppet theater drama "Go Taiheiki Shiraishi Banashi". The play is staged in Edo at the Moritaza; Matatarô plays the roles of Marigase Shûya and Dojô [casting]. 5th lunar month of 1780: Matatarô plays in the same theater the role of Ariômaru in the drama "Hime Komatsu Ne-no-Hi no Asobi". The role of Shunkan is played by Ichikawa Danzô IV. 9th lunar month of 1780: Matatarô plays in the same theater the role of the farmer Yomosaku in the drama "Yamatogana Ariwara Keizu". 11th lunar month of 1780: Matatarô plays at the Moritaza the role of Nanba Jirô, the villain of the "Shibaraku" scene starring Ichikawa Danzô IV, in the kaomise drama "Tokimekiya Oedo no Hatsuyuki", which celebrates the arrival in Edo of the Kamigata star Arashi Hinasuke I. 3rd lunar month of 1781: Matatarô plays in the same theater the role of Teraoka Heiemon in the classic "Kanadehon Chûshingura"; the roles of Yuranosuke and Okaru are played by Ichikawa Danzô IV and Nakamura Kumejirô. 11th lunar month of 1781: Matatarô plays in the same theater the role of Yawata no Saburô in the new year program "Nanakusa Yosooi Soga". 7th lunar month of 1782: Matatarô plays in the same theater the roles of Watanabe Minbu and the yakko Dampei in the drama "Datezome Shikata Kôshaku", whose plot and characters belong to the "Meiboku Sendai Hagi" world. 4th lunar month of 1783: Matatarô plays at the Moritaza the roles of the yakko Hatasuke, Sakama Denbê and Hosokawa Yoriyuki in the drama "Kagamiyama Kokyô no Nishikie". 2nd lunar month of 1784: Matatarô plays at the Ichimuraza the role of Denkaibô in the drama "Shinjû Ten no Amijima". 6th lunar month of 1800: Matatarô appears on stage for the last time, at the Ichimuraza, playing the role of Hida Saemon in the drama "Genpei Nunobiki no Taki". Bandô Matatarô IV was a good katakiyaku and tachiyaku of the second half of the eighteenth century. his forte were aragoto roles in jidaimono dramas. In the last years of his career, he took an active part in the management of the Ichimuraza but it did not work well and the theater had to close. He also managed a bath house in the district of Segawa-chô. The 13th day of the 9th lunar month of the 1st year of the Kyôwa era was the 20th of October 1801 in the western calendar.